12 pcs(including 12 colors). I am happy to service you. We solve your problem in 24 hours. 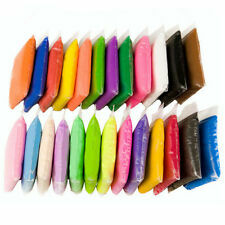 1 PC 60ml Clay toy. Great stress reliever for adults and children. Hasbro Play-Doh and modeling clay are toys for kids of all ages. Kids can make their own creations using the dough options offered by Hasbro, such as play-doh kitchen, play-doh touch, and play-doh shape & learn. Hasbro also makes sets that allow kids to use molds and tools with their dough. What skills does Hasbro Play-Doh help to develop in children? Spatial skills: Building toys like dough and clay help to develop spatial recognition skills, especially when children try to re-create something that they have seen using dough. They will also develop spatial skills such as proportion and hand-eye coordination. Fine motor skills: By playing with dough and clay, kids can develop fine motor skills by piecing, rolling, combining, and constructing the material. Artistic skills: Dough and clay are considered to be two of the tools that could be used for artistic expression. Children can develop their creativity and art skills as they model with the clay. Imagination: Products likes this can allow kids to model anything that they can imagine and encourages them to get creative using dough and clay. What other types of Play-Doh products does Hasbro make? Play-Doh Touch: This product lets you bring the clay models to life by putting the image on a tablet and animating it. The animated creature then has a whole digital world to explore. Play-Doh Kitchen Creations: This series of sets lets you make an assortment of foods. You can make noodles, ice cream, burgers, cupcakes, pizza, and more. You can use tools like the extruder to decorate cakes. Play-Doh Shape and Learn: These sets teach reading and mathematics skills. This series features sets that teach letters, shapes, numbers, and measurements. Play-Doh Doctor Drill and Fill: This toy allows you to play dentist by making teeth in a model head and then doing your own dental work. DohVinci: DohVinci sets allow you to decorate your own jewellery and other crafts such as picture frames. You can using DecoPops and a Styler that lets you make 3-D lines. What colours does Play-Doh come in? When you buy it in a set, Play-Doh generally comes in a pack of 10 colours, which includes all the colours of the rainbow. You also have the option of getting individual colours separately or in packs of three, four, or eight.